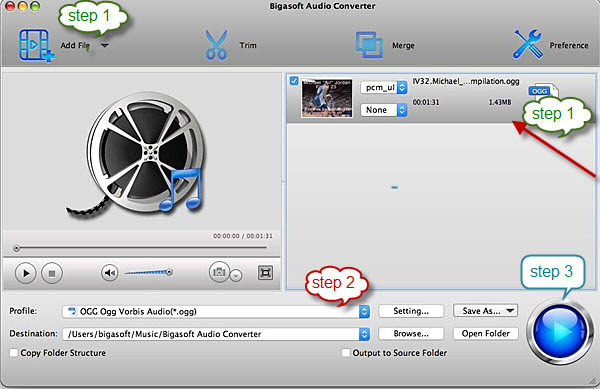 The Best Way to Convert Video to OGG-Bigasoft Audio Converter will Show you. This article will show you the best way to convert video to OGG with Bigasoft Audio Converter for Mac. So if you are seeking a way to convert video to OGG, such as convert MP4, MOV, AVI, MPEG, MPG, 3GP, DivX, Xvid, ASF, VOB, MKV, WMV, H.264, 3G2, FLV, MOD, TOD, MTS, WTV, WebM, etc. to OGG, this is the article for you. OGG format is a type of audio file that makes use of open source OGG Vorbis compression which is designed to provide efficient streaming and manipulation of high quality digital multimedia. The Ogg file is similar to an MP3 file, but has better sound quality than an MP3 file of same size. It can include song metadata, such as artist information and track data, and is supported by many media players and some portable music players. It is supported by devices such as Archos and Samsung but is not supported by Apple iOS devices. The OGG file type is a lossy codec which means that data is discarded as part of the compression technique, resulting in a smaller file size. Ogg files are optimized for music files, but will still be of acceptable quality for speech only files. Why do we choose Bigasoft Audio Converter to Convert video to OGG? Its strong decoding and encoding ability will guarantee a high quality output OGG file in very short time. By converting video to OGG, it means, it can almost convert any kind of videos such MP4, MOV, AVI, MPEG, MPG, 3GP, DivX, Xvid, ASF, VOB, MKV, WMV, H.264, 3G2, FLV, MOD, TOD, MTS, WTV, WebM, etc to OGG. You can batch convert hundreds of video files to OGG by just one click with Bigasoft Audio Converter. Second, it is an all-in-one audio converter. Not only being able to convert videos to OGG, it can convert videos to any audio formats such as OGG, M4R, WMA, APE, WAV, FLAC, MP3, APE, MP2, VQF, AAC, AUD, AIFF or convert any audio formats to the other. Also, it is also a good YouTube downloader. Third, it is easy to use. It takes only three steps to convert videos to OGG or convert any video or audio format to any audio formats. So, Bigasoft Audio Converter is the best way to convert video to OGG, or MP3, M4R, WMA, APE, WAV, FLAC, APE, MP2, VQF, AAC, AUD, AIFF or any audio format that are available at present. How to convert video to OGG? Second, three steps to convert video to OGG, in this case, we will take AVI for example. Step 1 Add the videofiles you want to convert to OGG. Method 2: Click Add File and choose the video file that you want to convert to OGG. 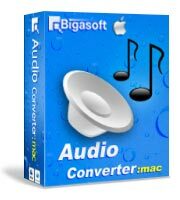 Bigasoft Audio Converter for Mac is the best way to convert videos such as MP4, MOV, AVI, MPEG, MPG, 3GP, DivX, Xvid, ASF, VOB, MKV, WMV, H.264, 3G2, FLV, MOD, TOD, MTS, WTV, WebM, to OGG. It can also convert any audio formats such as MP3, M4R, WMA, APE, WAV, FLAC, APE, MP2, VQF, AAC, AUD, AIFF to the other.